Discover the ancient story of Niagara Falls in 4D and re-live the exciting experience in this 360 degree multi-sensory theatre. Water will bubble and spray as you travel down river, while snow falls all around simulating the last Ice Age. The moving platform beneath your feet will help you understand the power of nature as you’re surrounded by stunning visuals of the mighty Niagara River. This family-friendly attraction provides a great introduction to your Niagara Falls adventure. 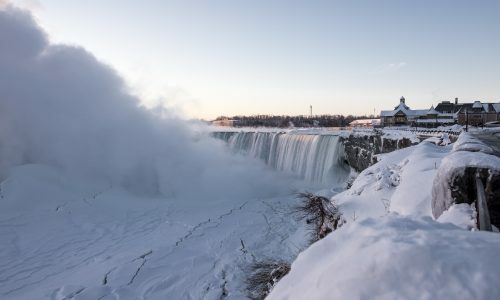 The Niagara Peninsula became free of ice from the last Ice Age about 12,500 years ago. As the ice retreated northward, its melt waters began to flow down through what became Lake Erie, the Niagara River and Lake Ontario. Niagara Falls was originally located at the escarpment at Queenston-Lewiston and continued to steadily erode through the bedrock to it's current location over the next 10,000 years. 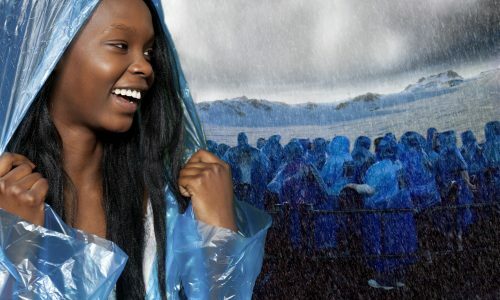 Whereas the fully biodegradable ponchos provided at Journey Behind the Falls are yellow and those Hornblower Niagara Cruises are red, visitors to Niagara's Fury receive complimentary blue ponchos to stay dry.